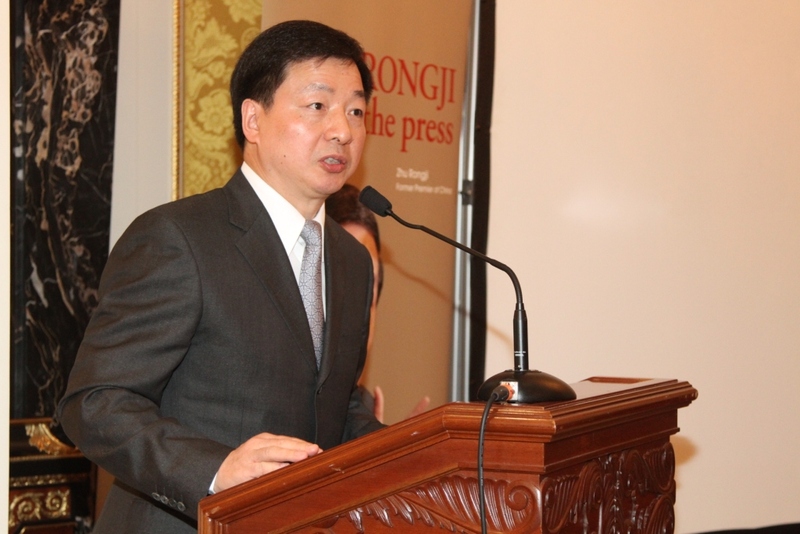 On the afternoon of April 11, a bright spring day in London, the launch of the english edition of Zhu Rongji Meets the Press was held at Bentley Hotel. Mr. Yu Zhengsheng, Politburo member of CPC Central Committee and Shanghai Party Secretary, who was on his visit to the UK, attended the launch. 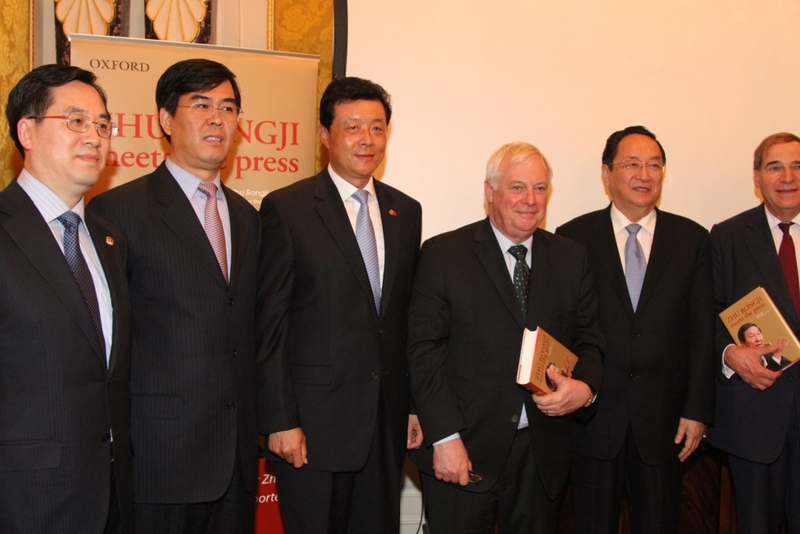 Mr. Liu Xiaoming, Chinese Ambassador to the UK, Mr. Zhou Mingwei, President of China International Publishing Group (CIPG), and Lord Patten of Barnes,Chancellor of the University of Oxford, delivered speeches at the launch. 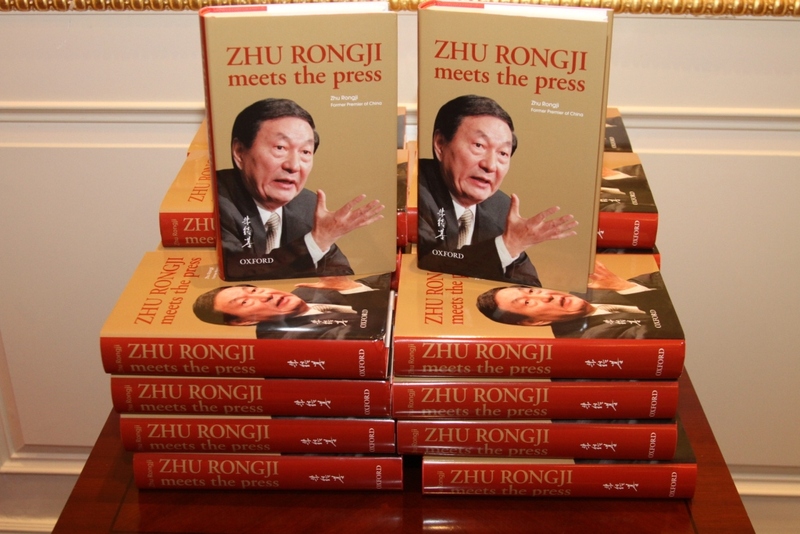 Zhu Rongji Meets the Press is a collection of Mr. Zhu Rongji's interviews with Chinese and foreign journalists and some of his overseas speeches from 1991 to 2003 as Premier and Vice Premier of China. It reflects a series of major economic reforms in China during its critical period of transformation from a planned economy to a socialist market economy and a range of major events in the country, from inflation control to the response to the Asian financial crisis and to the WTO accession after difficult negotiations. After being published in the Mainland of China in 2009, the Chinese edition of the book has been widely welcomed and has been selling well. After that, a Traditional Chinese edition has been published at the request of overseas Chinese and a Korean edition has been published in the Republic of Korea. This English edition is published by Oxford University Press for worldwide distribution. In his televised speech at the launch, Mr. Zhu Rongji extended sincere gratitude to the Chinese and foreign guests present at the launch and to the friends who participated in the editing, translation and publishing of the book, expressed appreciation and respect to Dr. Henry Kissinger, who wrote the foreword for the book, and extended the best wishes to the British people. He said: "I hope this book will help people understand China and promote cooperation. I dare not say how correct the arguments in the book are, nor do I dare to wish that all the readers will agree with my views. What I want to say is that everything I said in this book is true. This is a principle I uphold throughout my life." Listening to Mr. Zhu's speech and seeing his recent look, the participants showed strong interests and responded with warm applause. 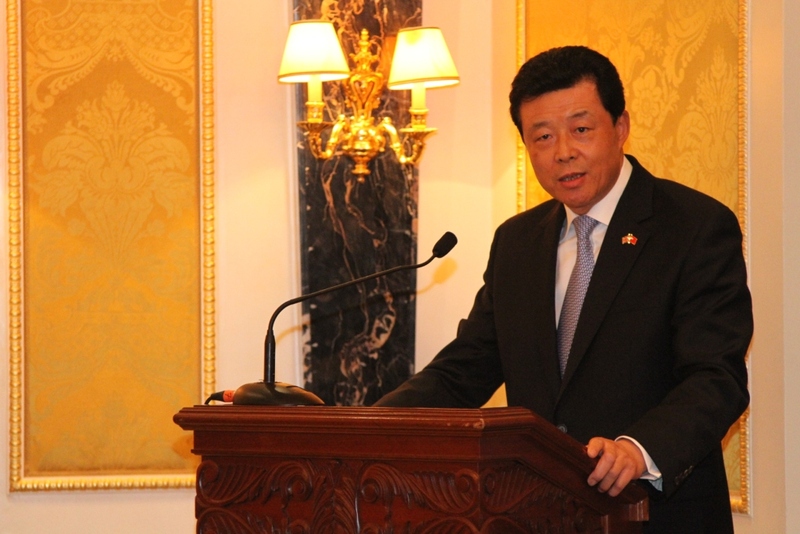 Ambassador Liu Xiaoming congratulated the Oxford University Press on publishing the English edition of the book in his speech and thanked the Press for their excellent work. He also affectionately recalled his several encounters with Mr. Zhu. The Ambassador said that readers will be reminded of Mr. Zhu's contribution to China's foreign policy and to peace and development of the world. His important contribution has been recognised by the many deep friendships that he enjoys worldwide. Mr. Zhou Mingwei, CIPG President, said in his speech that readers can see from this book how Mr. Zhu coped with the double-digit inflation and unemployment of millions of people in 1990s, how he dealt with corruption, bankruptcy, deficit, natural and man-made disasters and unexpected events and how he responded to some misunderstandings, suppression and opposition from the international community, and they can also see much more than a Premier of a big country, but an ordinary person who would be happy, sad or angry like anybody else and his truthfulness, humour, frankness and wisdom. 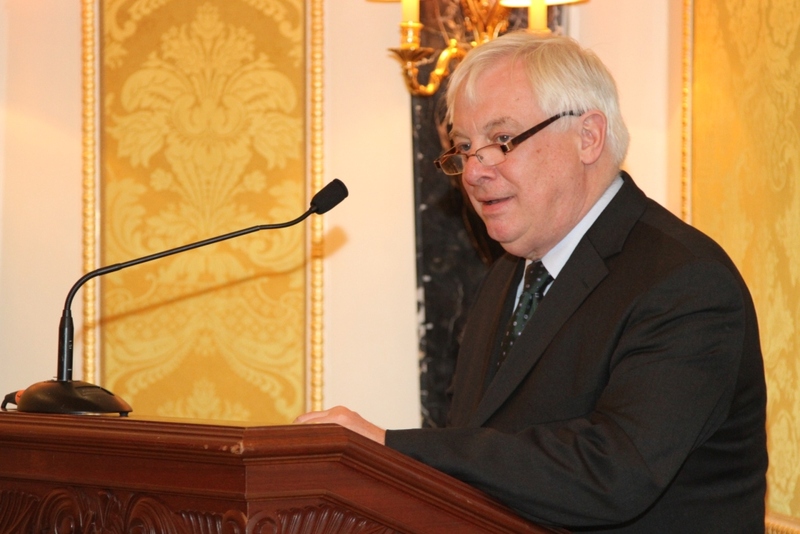 Lord Patten said in his speech that he was delighted that Oxford University Press has published the English edition of Zhu Rongji Meets the Press and congratulated Mr. Zhu and his office. The book is a historic one because it is the first book by a living former Chinese Premier to be published outside of China. Mr. Zhu is widely known in the world for his great contribution to the sustained growth of Chinese economy and the relations between China and the world. Lord Patter believed that this book will help people from all walks of life to have a better understanding of China's development and the evolution of the country's role in the world in recent decades, and of the outstanding leadership of Mr. Zhu. The launch was attended by nearly a hundred Chinese and foreign guests, including Mr. Ding Xuexiang, Secretary-General of CPC Shanghai Municipal Committee, Lord Brittan, Trade Adviser to the Prime Minister and Mr. Stephen Perry, Chairman of the 48 Group Club.